Devika Sundar is a Contemporary Artist based in Bangalore. Her practice moves and shifts across different media, combining elements of collage, painting, and printmaking with photography and installation. Her work explores art as a narrative medium of human connect; expressing collective themes of invisibility, memory, transience, and longing within personal and shared human experience. Through her practice, she feels moved to articulate and give form to universally intangible feelings that lie deep within each of us, while critiquing, undoing and unraveling the walls and layers of cultural conditioning that disengage us from one another. A Contemporary art graduate from the Srishti Institute of Art Design and Technology, Devika will be presenting her current series, “ Essentially Normal Studies” as a keynote speaker in the 2nd International Conference on Myofascial Pain Syndrome and Fibromyalgia Syndrome in October 2018; a conference organized by Indian MYOPAIN Society, a chapter of International Myopain Society. 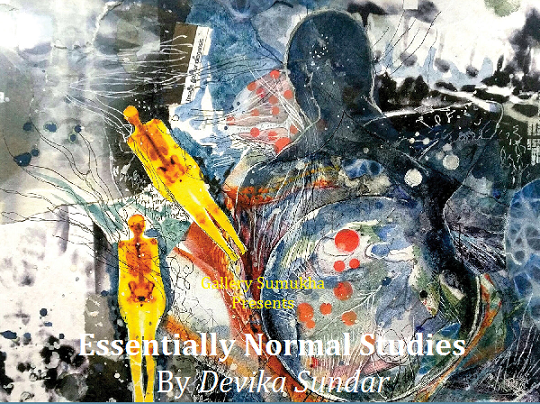 In her current series, “ Essentially Normal Studies”, Devika draws from an uneasily dissonant relationship with her physical body, in her experiences living with fibromyalgia, a debilitating, lifelong and invisible chronic pain condition. Through her explorations, she examines the experiences of others suffering from poorly understood invisible physical illness or disabilities, particularly complex conditions presenting pain, inflammation, fatigue and other chronic, debilitating, yet hidden symptoms. Many who suffer from invisible illness feel a dissonance between their visible seemingly “normal” self and the invisibility of a disabling and debilitating physical condition, and most go through years of dismissal before finding diagnosis and acceptance within their community. 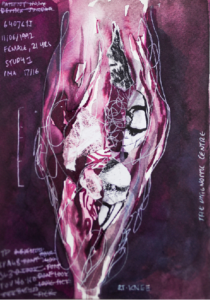 In this exhibit, Devika collates mixed media artworks comprising of photographic light installations, journalled paintings and drawings, silkscreen prints and moving image videos; abstracting, reworking and overlaying her medical scans in different ways. She expresses and reveals the underlying layers, frictions and tensions of invisibility and physicality that exist within hidden disability.